If you haven’t tried to make candy, this is a great recipe for a beginner. 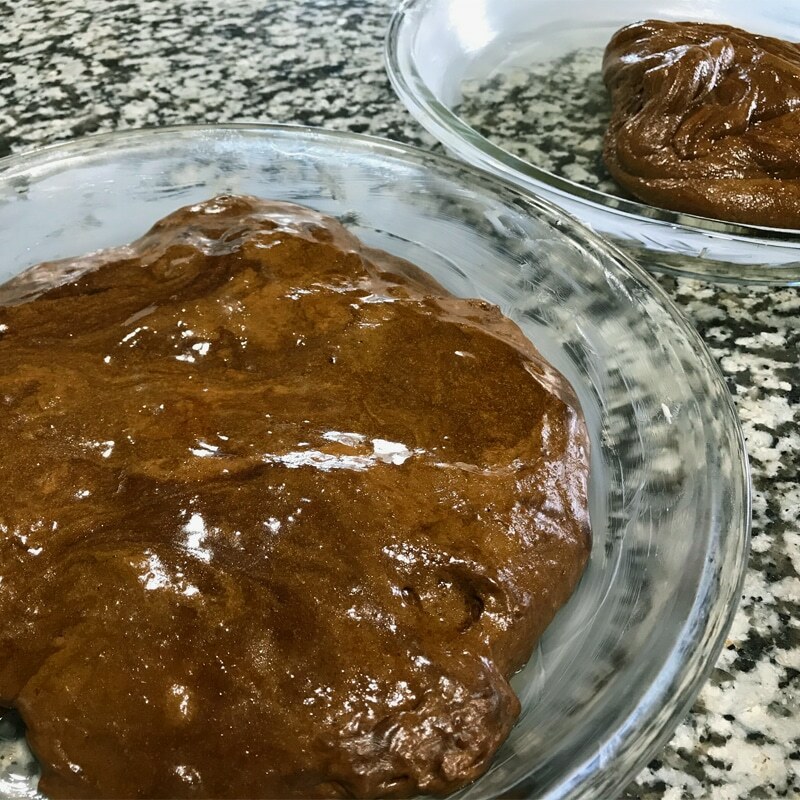 Quick and Easy Molasses Candy is very simple and almost impossible to mess up. It doesn’t take much more than an hour to get these into a dish, and they are tasty! 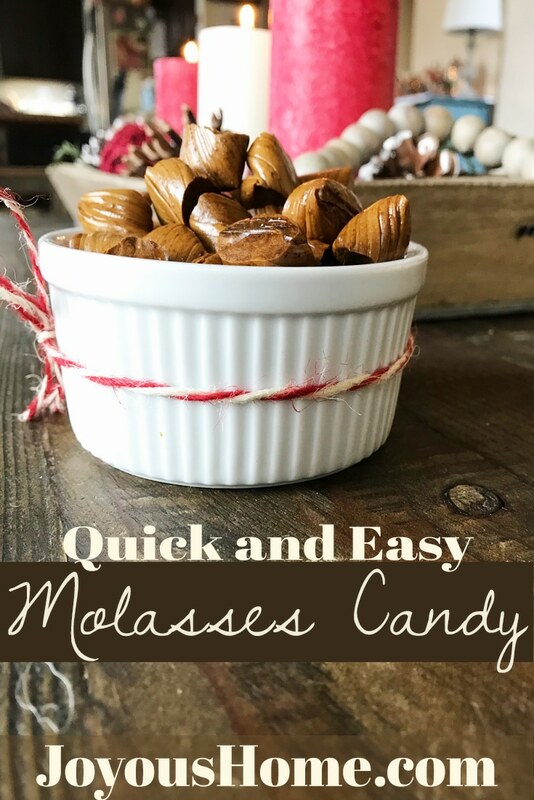 This molasses candy is delicious and addicting! I hope you enjoy it. Butter two glass pie pans and set aside. You will need a candy thermometer. In a 3 qt. heavy bottom saucepan, stir together the molasses, sugar, butter, and vinegar. Bring to a boil over medium-high heat, stirring just until the mixture comes to a boil. Clip a candy thermometer on the side, make sure it doesn’t touch the bottom of the pan. 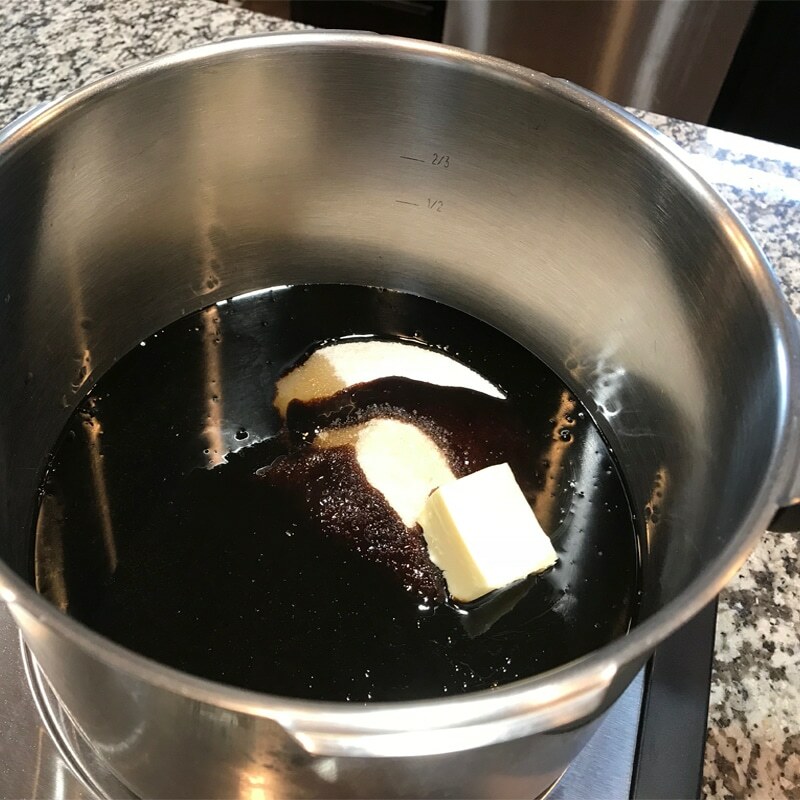 Without stirring, boil over medium heat until the syrup reaches 265 degrees. Add the baking soda stir. Pour the molasses candy mixture into your two prepared pie pans, dividing it evenly between the two. 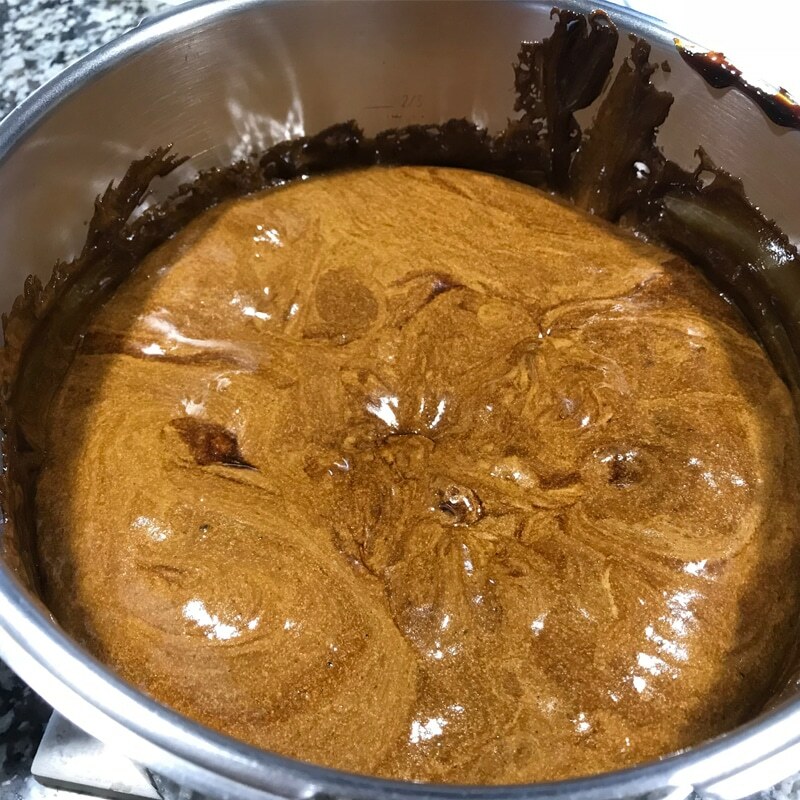 Let the molasses candy cool until you can handle it but it’s still warm. Work with one batch at a time. Begin pulling the molasses candy into ropes. This is very simple! Pull the candy, double over and pull again. See the video. 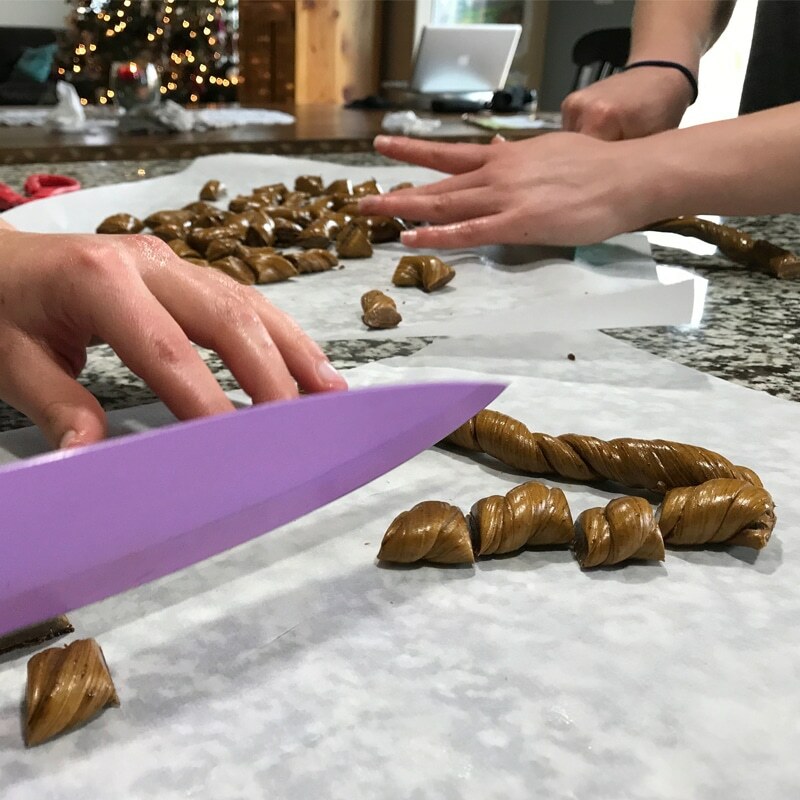 Continue pulling and doubling until the molasses candy is shiny and golden in color. Quickly stretch into a rope about 1/2″ wide. With a pair of kitchen scissors or just a sharp knife, cut the candy into 3/4″ pieces. Let all the molasses candy cool completely. Store in airtight containers. Makes about 6-7 dozen. In the first video clip, I mention we are at high-altitude but became distracted and didn’t finish that sentence until the second clip. (hence, we ain’t doing quick clips anymore holding the camera ha!) So, boiling to 265 degrees is for sea-level. I explain a little in the video, but if you are high-altitude you’ll want to do a search for candy making at ‘your’ altitude. Let the molasses candy cool until you can handle it but it’s still warm. Work with one batch at a time. Begin pulling the molasses candy into ropes. This is very simple! Pull the candy, double over and pull again. (See video above). Going to make this tomorrow! I hope you try it! Thanks for dropping by! I love how the old fashion way is making a come-back. Thanks for sharing. You’re very welcome! Thanks for dropping by today! Perfect timing, I just purchased a jar of molasses at the store, time to make candy! Hi Nancy! I’m ready to make more. They really are good! Thanks for visiting again! My son loves molasses, this will be a fun record to try with him. I hope you all enjoy it. Such fun, thanks for visiting today! This is just what I’ve been looking for! We do a cookie/candy exchange and it’s a great change from our usual, I know I’ll be the only one who brings it. Yes, they are unique! Enjoy and thanks for visiting today! Old fashioned pulled candy . . . the apple cider and molasses provide nutritional benefits, too. Love! Hi Kristi! Very yummy, make some for Christmas. Hugs to you all! Have fun, our kids love them too! Thanks for visiting! This would make a nice Christmas gift. Thanks! They are perfect for a gift! I hope you enjoy them! Thanks for visiting today! I am thinking I will use this as part of my bake exchange recipe coming up! It will be a hit! It packages pretty too. Have fun and thank you for visiting today! I would love to know if you like it! Thank you for stopping by! I will try this tomorrow with my children! I love molasses! Mmmm! Thanks for the recipe. You’re welcome! Thanks for dropping by today! this is one thing my young cookie baker has been trying to make without success — can’t wait to try your recipe! I have never made anything like this. Looks good. Thanks. I hope you give it a try. It’s a great gift! Thanks for dropping by today! I love molasses, so I bet I’ll love these! I wonder if they will break my teeth or if it’s sticky? Either way, YUM and probably worth it! And by the way, I’ve always avoided recipes that require a candy thermometer, even though I have one. It always seemed involved, but maybe I’ll actually give these a shot! Well, don’t bite them, they might break a tooth! They are yummy. For a thermometer, I think I’m going to upgrade to a digital candy thermometer. The clip on ones work fine and are cheaper, but my daughter put mine in the dishwasher after that video. Not sure I’ll trust the temps now! Thanks for dropping by! They truly are! Thanks for coming by today! 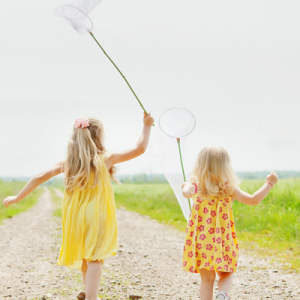 This looks like something that would be fun to make with my daughters. We had fun with it. It doesn’t take long either! Thank you for dropping by! I’ve never had molasses candy. I have everything for this but the thermometer. A store trip I will need to make. Let us know if you like it. It’s our favorite Christmas candy. Thanks for dropping by!